The al Qaeda terror organization is using Google Maps to plan precision jihadist attacks across the Middle East, according to a new propaganda video released by al Qaeda in the Arabian Peninsula that features a former Guantanamo Bay prisoner who has since returned to the terror group after being freed from the prison, according to a new report from a regional media monitoring organization. Al-Malahem, the media arm of Al-Qaeda In The Arabian Peninsula, or AQAP, released on Friday a propaganda video featuring Sudanese national and former Gitmo detainee Ibrahim Al-Qusi, a onetime financial asset for al Qaeda who was arrested in December 2001 and spent more than 10 years as a convicted terrorist in Gitmo before being released to Sudan in 2012. Al-Qusi appears to be one of many former Gitmo inmates who returned to the battlefield after being freed from Gitmo. 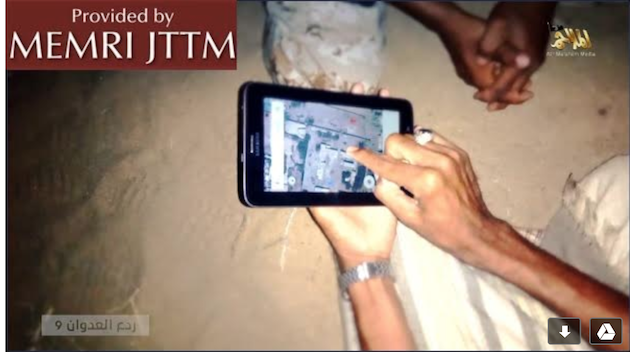 In the newly released video featuring al-Qusi, "AQAP also documents the training, planning, and execution of a series of operations targeting security forces, checkpoints, and military bases in multiple locations using different tactics including martyrdom operations, commando raids, shelling, shootings, and assassinations," according to a new report from the Middle East Media Monitoring Institute, or MEMRI. 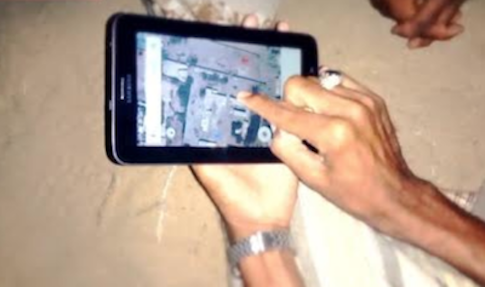 "In the planning of one operation, an AQAP commander used a tablet computer and Google Maps," according to MEMRI, which provided screenshots and full report on the situation to the Washington Free Beacon. Al-Qusi takes direct aim at the United States and its alliance with the United Arab Emirates, or UAE in the video footage, which calls for new terror attacks. "After accusing the UAE of leading the war against Islam by building prisons and detention centers where men and women are imprisoned and by killing innocent people in Yemen, the video featured Al-Qusi saying: ‘Today, the U.S. is trying to use a new card and a new [pair of] shoes from its [collection]: the government of the UAE and its treasonous army,'" according to MEMRI's research. The AQAP video honors "dozens of martyred AQAP member" and commends local jihadist fighters in the Abyan province in Yemen for "implementing sharia laws, promoting virtue, preventing vice, and securing the city." "The video then said that the U.S. was using Arab governments to wage war on the mujahideen, and presented video and audio recordings of prominent jihadi officials and preachers such as late Yemeni-American sheikh and AQAP figure Anwar Al-‘Awlaqi and Abu Al-Hassan Al-Bulaidi. Al-Bulaidi is a late official from Al-Qaeda In The Islamic Maghreb who condemned Muslim rulers and accused them of betraying the Muslim ummah," according to MEMRI. This entry was posted in National Security and tagged Al Qaeda, Terrorism. Bookmark the permalink.